Sand volleyball a LIFETIME sport! Want to improve your indoor skills or want to enhance your outdoor game? Sign up today for Spring JSL™. OPEN to ALL players (boys & girls). 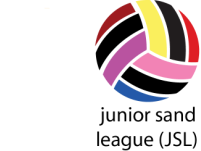 NCAA and Beach Volleyball Updates! Be a part of Beach Volleyball history! Witness the endurance, speed and power of elite collegiate athletes on the sugar white-sand beaches of Gulf Shores, Alabama at the NCAA National Collegiate Beach Volleyball Championship. Watch eight teams compete on five courts over the course of three days to be crowned the first-ever NCAA Champion in beach volleyball.